We have a winner for Tim Laird's "That's Entertaining" book and it is Bonnie Bee! marks the beginning of the Cherry Blossom Festival in Washington, DC. peak blossom time, it is enchanting. Each year, the National Cherry Blossom Festival commemorates the 1912 gift of 3,000 cherry trees from Mayor Yukio Ozaki of Tokyo to the city of Washington, DC. The gift and annual celebration honor the lasting friendship between the United States and Japan and the continued close relationship between the two countries. In a simple ceremony on March 27, 1912, First Lady Helen Herron Taft and Viscountess Chinda, wife of the Japanese ambassador, planted the first two trees from Japan on the north bank of the Tidal Basin in West Potomac Park. Between the governments of the two countries, the financial backing of Dr. Jokichi Takamine, a world-famous chemist and the founder of what today is the global pharmaceutical company Daiichi Sankyo, Dr. David Fairchild of the U.S. Department of Agriculture, Eliza Scidmore, first female board member of the National Geographic Society, and First Lady Helen Herron Taft, the trees arrived in Washington. A first batch of 2,000 trees arrived diseased in 1910, but did not deter the parties. Just two years later in 1912, new trees arrived and were planted. 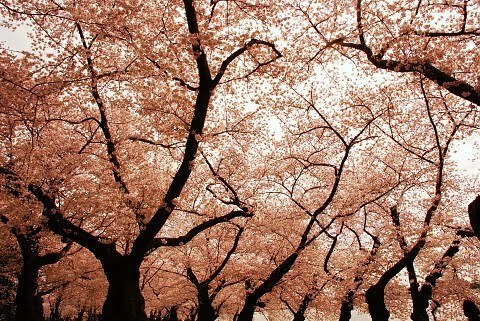 These are the trees that now turn the Tidal Basin into a cloud of pink each spring for all to enjoy. In 1915, the United States Government reciprocated with a gift of flowering dogwood trees to the people of Japan. A group of American school children reenacted the initial planting in 1927 and the first “festival” was held in 1935, sponsored by civic groups in the nation’s capital. First Lady Lady Bird Johnson accepted 3,800 more trees in 1965. In 1981, the cycle of giving came full circle. Japanese horticulturists were given cuttings from the trees to replace some cherry trees in Japan which had been destroyed in a flood. The Festival was expanded to two weeks in 1994 to accommodate a diverse activity schedule during the blooming period. Today, more than a million people visit Washington, DC each year to admire the blossoming cherry trees and attend events that herald the beginning of spring in the nation’s capital. Don't forget to enter my giveaway~information here. I'm in love with these two baskets lined with paisley print. but I think they'd make an adorable pocket book for summer too. the giveaway for Tim Laird's "That's Entertaining!" book. I'm joining Table Top Tuesday at A Stroll Thru Life. I first posted about the man cave renovations here back in September. These are some before shots of that post. Boy has it been a loong winter with out my heated two car garage! the man cave is nearing completion. "kitchen" side have been re-drywalled and painted. and rehung on the opposing wall. A shelf unit was installed along with a black storage cabinet. Hooks hung for the many shovels, racks, etc. Still to do: the flooring, work sink and parking side dry wall. signed copy of "That's Entertaining!" by Tim Laird. of his new book "That's Entertaining!". Tim Laird is an authority on wines and spirits with more than 20 years experience in the hospitality industry. A connoisseur of fine wines, spirits, and champagnes, Tim is also a gourmet chef and a master at entertaining and execution. Tim is a veteran of television and radio having appeared on both approximately 100 times in the past year including: The Tonight Show, CNN, FOX News Network, Fox & Friends, The Today Show, CBS Early Show and CNBC. Tim also hosts Secrets of Bluegrass Chefs and Secrets of Louisville Chefs Live, a weekly TV show shown in the Kentucky region. near the Louisville, KY area. However, do not worry, I remembered you too! 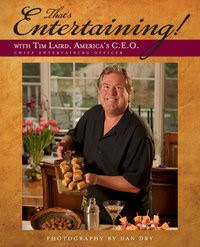 I am giving away one copy of Mr. Laird's book "That's Entertaining!" as we lead up to Saturday. you will be entered more than one time. a signed copy for $35, plus shipping costs. expressed a need for a new accessories. Miss Madison will be so fashionable in her pink and green!
" 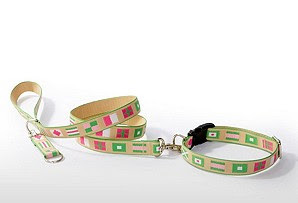 Packed with preppie style, Harry Barker's fun, eco-friendly doggie beds, pet dishes and kibble canisters are as warm and unique as the woman who created them. Carol Perkins, an ex-model and fire-eater for Penn & Teller on Broadway, began creating dog beds, toys and robes for friends, at her kitchen table. Her creations were an instant hit, and Harry Barker—named after her Super-Sheltie—came to be. " They had some super cute stuff! in your grocers floral department this week. 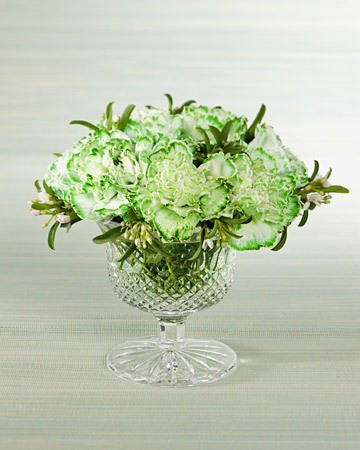 Above is another easy example of a centerpiece. 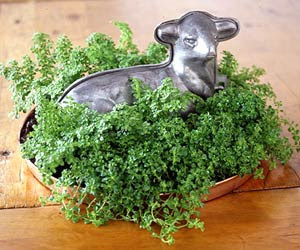 How about some parsley arranged with this cute lamb? 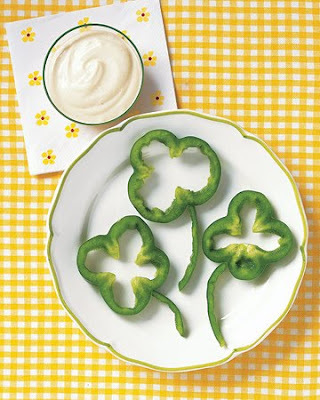 Or some green peppers fashioned as clover-so cute! 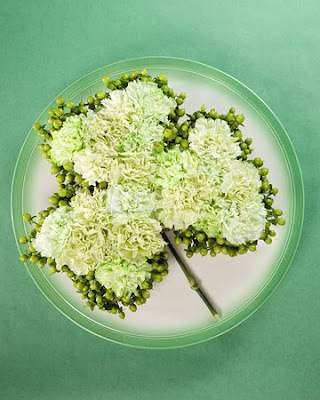 can eat them on Friday! Here's a long shot from the corner of the shop. The vintage fringed table cloth has apples in the design. A bird's eye view shows the treats that await. "When I County My Blessings, I Count You Twice"
says the heart-shaped plate, which applies to all of you! I always try to carry a few cutting boards. I think they make great gifts. We could all use a fresh board on our counter top. Lots of winged creatures join our green table. And a few herb towels. And vintage hand embroidered tea towels. 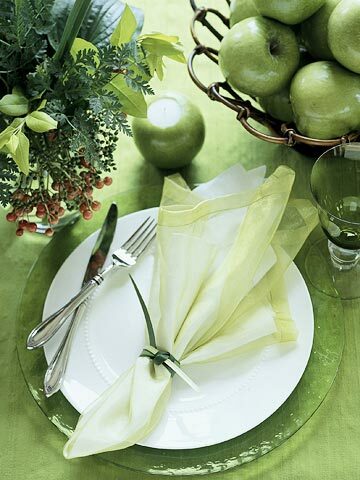 Hope Spring is bringing green to your home this week! Helping you live a life Beeutiful by Design to celebrate the blessings of family and friends with easy and elegant ideas mixing vintage and new!